← Why is the British media obsessed with keeping Britain white? Wolverhampton police were supposedly caught off guard as around 50 members of the English Defence League (EDL) marched through Wolverhampton town centre on Saturday morning. According to Jonny Greatrex, writing for the SundayMercury.net, shoppers and town centre staff fled when a crowd of EDL protesters chanted slogans along Dudley Street. A police spokesman said that the protesters arrived 11.45am and left around 2pm. Although the Sunday Mercury.net report suggests that the EDL march came as a surprise to the police a police spokesman said that the police was aware of the protest, and that they were prepared for it. If this was the case one has to ask why black and minority ethnic communities in Wolverhampton were not given any kind of warning by authorities? 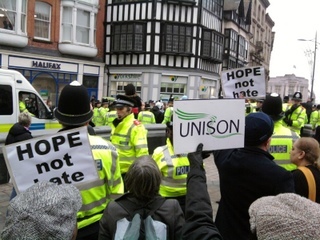 The Wolverhampton, Bilston & District Trades Union Council website reported that Unite Against Fascism activists, trades unionists, labour councillors and local local Labour MP Pat McFadden, organised a swift counter demonstration to oppose the EDL in the city with only 18 hours notice. The EDL has been growing in support these last few months and with the government budget cuts and economic recession there is no sign that support for them will dwindle. Formed in 2009 the EDL claims to be a non racist organisation whose only aim is to combat the rise of Islamic fundamentalism in Britain. They have even targeted different Asian groups in Britain who they know have a history of animosity towards Muslims. This is a tactic now being used by the far-right to portray themselves as non racist, such as when the British National Party recruited their first non-white member, Rajinder Singh, a Sikh in his late 70s with a vehement hatred towards Muslims. The tactic used is the old colonial divide and conquer trick and should not mislead black and minority ethnic communities. The EDL never addresses how British foreign policy has led to the threat Britain now faces from militant Muslims, tired of western war crimes being ignored by the United Nations and other international bodies. The EDL never addresses the atrocities and war crimes committed by British troops in Iraq and Afghanistan in conflicts fought for resources and immoral purposes. The rise of the EDL and other far-right groups should be placed at the door of the British government which continues to deceive its own people about the role they play overseas. It is these issues which need to be exposed when the EDL marches in a town. It is these issues which the anti fascists and anti racist groups should unite against. This entry was posted in Regional News and tagged EDL, English Defence League, Wolverhampton Bilston & District Trades Union Council. Bookmark the permalink.